Just as we expected, Google today announced a trove of new products, including a very-classy tablet running Chrome OS - the Pixel Slate. 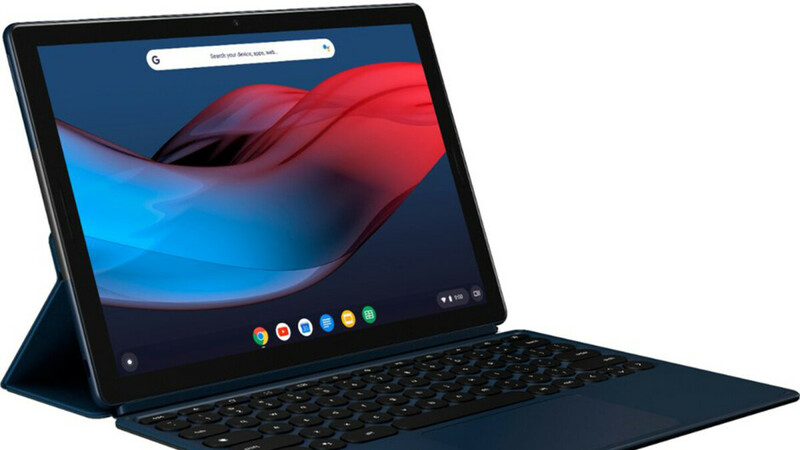 Thin and light, the Pixel Slate is available in stylish Midnight Blue and appears to be a rather sleek gadget that aims to further bridge the diminishing gap between tablets and laptops. The Pixel Slate also comes with a USB Type-C port and dual front-firing stereo speakers, which would certainly make it a much more capable multimedia machine. There's also a fingerprint scanner on the Pixel Slate, and its embedded into the side-positioned power button. Google isn't forgetting about the cameras - we get two 8MP cameras, a wide-angle one at the front and another one at the rear. The focus here is on the front-facing one, which is aimed at providing excellent image quality for video calls with its wide-angle lens and larger pixels for improved image quality. It comes with a portrait mode, too, for that occasional Instagram or Snapchat selfie. At the front, we have a 12.3" so-called "Molecular Display" with a resolution of 3000 by 2000 pixels and a pixel density of 293ppi, making it quite sharp. There are two USB Type-C ports available on the slate, which are used for either 4K data transfer to compatible screens as well as charging. Speaking of charging, the Pixel Slate comes offers up to 10 hours of battery life, as per Google's own stats. Fast charging is part of the mix, with the Pixel Slate being able to receive a full charge in around 2 hours and 15 minutes. The Pixel Slate supports the new $199 Pixel Slate Keyboard and the $99 Pixelbook Pen. The keyboard is silent and also houses a trackpad, making it that much more usable than your regular snap-on keyboard accessory. Oh, and you can easily access the Google Assistant by simply tapping the dedicated button on the bottom-most row. You can recline the Pixel Slate to great extents with the keyboard attached, which further makes it a super-useful accessory. There are some promotions included in the mix as well - by purchasing the Pixel Slate, you get three months of YouTubeTV for free. It's on the house! In terms of pricing, the final tally will depend on the hardware configuration you choose. 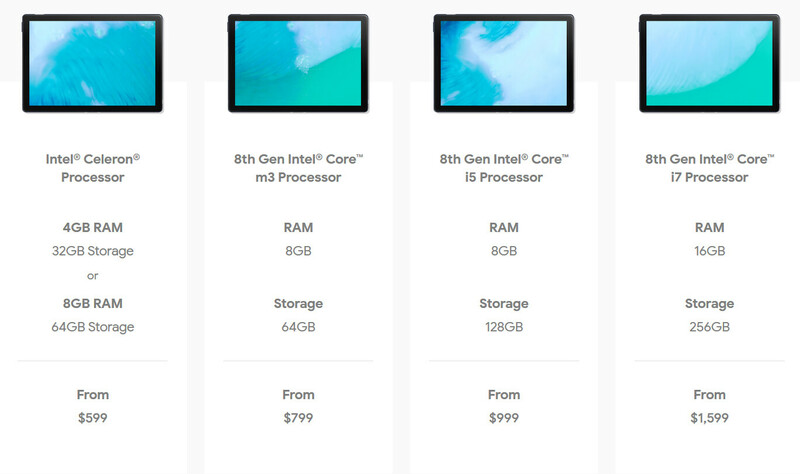 See, you can choose between a variety of Intel processors ranging from Celerons, to 8th gen m3, all the way up to 8th gen i5 and i7 chips. RAM varies from 4GB in the most affordable option all the way up to 16 gigs in the most souped-up variant; the same applies to the storage, which varies between 32 and 256 gigs. 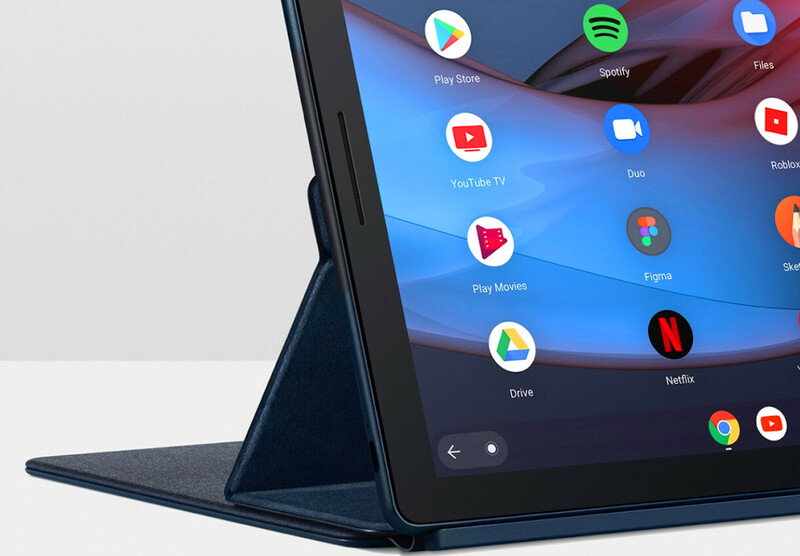 In terms of software, the Pixel Slate runs on Chrome OS, meaning you can access all the Android apps and games on the Play Store. The UI of Chrome OS has been optimized and reimagined, and truth be told, now looks much more appealing and intuitive than before - it's something you might actually want to interact with on a daily basis. Don't let its resemblance to Android fool you - it's not a maximized version of Android, but a whole new interface putting the emphasis back to the desktop experience. Split-screen plays a big part of the reimagined Chrome OS, and so does the Google Assistant, which does everything it does best. As demoed on stage, you will be able to run developer tools and full-blown Linux apps if you need to. The Pixel Slate intelligently manages updates on its own by downloading and installing them in the background while you work or play, ensuring that you're always up-to-date. Security has been put on a pedestal here, with the Titan M chip on deck making sure all of your data, passwords, and sensitive information remain safely encrypted on the device, away from prying eyes and hands. Since it doesn’t specific apps that made for chrome os like iPad nope it’s not. What the use of all massive powerfu hardware since there’s no specific apps that take the advantages of hardware?!. Those specs is just overkill for a Chromebook. I want to like it but it's too expensive. still better than ipad... just needs some specific apps. Actually looks pretty good, but it would be nice if more tablets followed the Surface Pro and have the kickstand built-in. Other than that, Pixel Slate is kind of an ugly name. I'd buy one because I want to extensively use ChromeOS. This costs more than what I wanted to spend but I may still get it. I will wait for battery life and performance comparisons before I decide though. I'm sorry but this is just dumb. 599 dollars for 32GB Celeron tablet with no headphone jack (?????) and no keyboard (200 dollars) and pen included (100 dollars). It's basically 800 dollars for underpowered convertible "laptop" running Android apps. Sorry but what. The full blown setup costs 1899. God that's a lot of money. I know right! You could buy 2 Celeron laptops with price. The best part of the event.